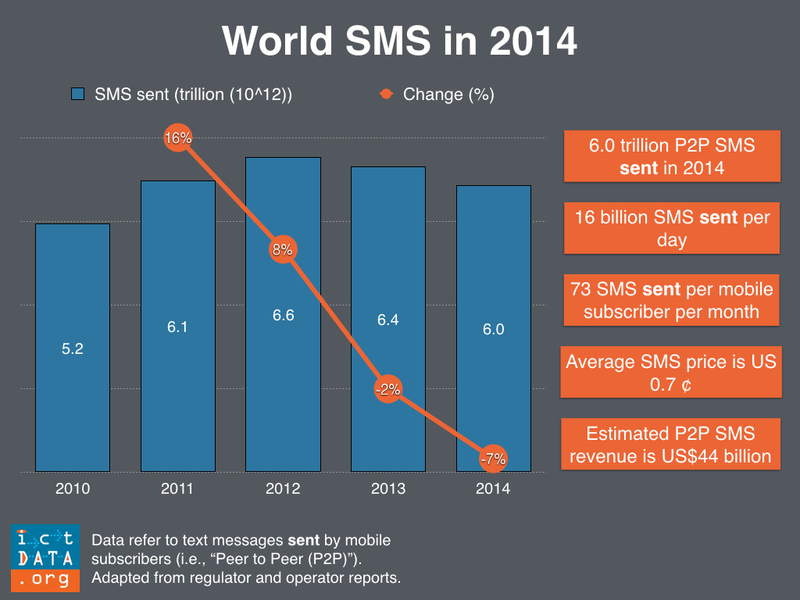 The number of SMS sent by mobile subscribers around the world continued to decline in 2014. After peaking at 6.6 trillion messages in 2012, the text message market dropped 7% from 2013 to reach 6.0 trillion messages in 2014. Nonetheless SMS continues to remain attractive particularly given its universality--any mobile subscriber can be reached by a text message. The 6.0 trillion messages sent around the world in 2014 translate to some 16 billion per day. The statistics indicate that mobile subscribers around the world sent on average 73 SMS per month. The average retail price of a SMS was 0.7 US¢ (US$0.007) in 2014 (calculated as messaging revenue / number of SMS). This translates into retail revenues of around US$ 44 billion from peer to peer text messages for the world's mobile operators.It's quite astounding that a difference of 0.1 US¢ in average revenue per text makes of difference of US$6 billion in revenues. From World SMS Markets 2014. Features 10 year time series of P2P SMS traffic for over 50 countries accounting for over 95% of the world SMS market as well as supplementary data for select countries (messaging revenue, SMS users (% of mobile users), SMS termination rates).